The Internet has become central to our contemporary lives, and yet it defies simple explanation. 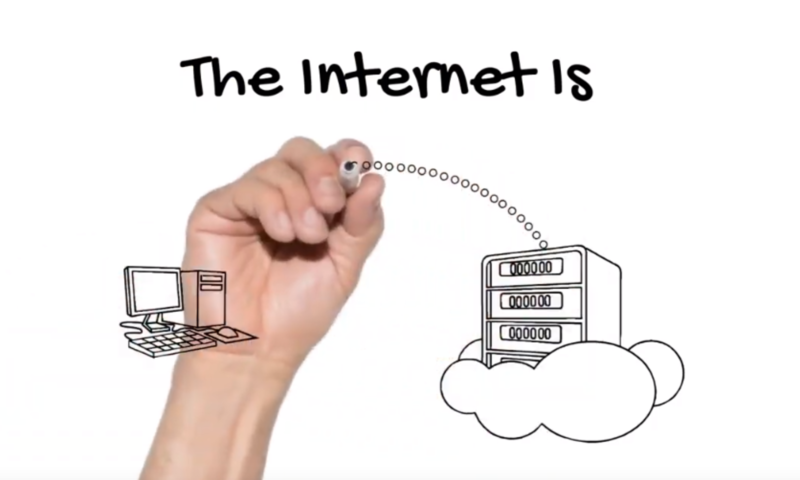 This explainer video and text gives a bird’s eye view of the Internet and how infrastructure is the key thing that connects us all. The Internet has been described as a ‘network of networks’. That’s true — telecommunications providers draw fiber around the world, and they trade Internet traffic across those wires. That traffic consists of all of the movies, pictures and memes you see on a daily basis. We call that ‘content’. The heart of the Internet exists between this telecommunications component and the content that users send to each other across those wires. That is what we call the Internet’s ‘infrastructure’. Internet infrastructure is the physical hardware, transmission media, and software used to interconnect computers and users on the Internet. Internet infrastructure is responsible for hosting, storing, processing, and serving the information that makes up websites, applications, and content. Here’s how all that comes together. The datacenter represents the fundamental building block of the Internet’s infrastructure. A datacenter is a large building filled with ’servers’, which are just basically computers optimized to run Internet processes. Data centers can be owned by a single large company who uses all those servers for their own purposes, or they can be carved up into sections and sold to other Internet infrastructure companies to rack and stack their own servers. These are called ‘multi-tenant datacenters’. When I describe those as the heart of the Internet, I’m not kidding. The telecommunications companies all connect there to trade their traffic. The content providers all upload their new content there. All the rest of the Internet infrastructure companies live there. These Internet infrastructure companies do things like operating ‘web hosting’ or ‘domain name’ services, storage, backup, virtual private network (VPN), or acceleration services. Web hosting companies are what you use when you want space for a website, and domain name services generally sell you the name of the site, like “christiandawson.com”, and help make that your official space on the web. Storage and backup services do just that, save all the content and files we need in a secure space. VPN’s provide encrypted access to a remote computer over the Internet. The play an important role in keeping sensitive information secure. Now, I’ll take a moment to explain what Internet infrastructure is not. As we made clear, Internet infrastructure does not include the telecommunications providers or the content providers. Internet infrastructure providers do not create, communicate, access, modify or destroy information. They are not the websites of the Internet, they are the developers of underlying services. The global economy is increasingly digital. This means the Internet and its underlying infrastructure are vital parts of it. To learn more about how the Internet’s infrastructure works, we encourage you to reach out to the Internet Infrastructure Coalition, or i2Coalition. Our goal is to be a singular voice and resource to policy makers who need to better understand how the Internet works.